Family life is a very important part of life in Greece. Children often live with their parents even after they get married. 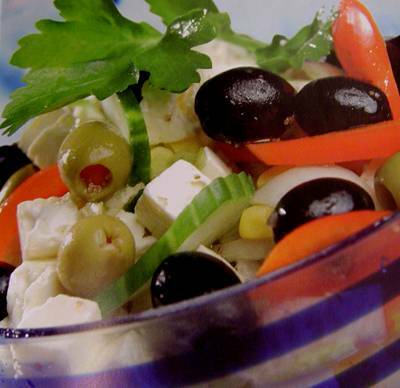 Greeks live long lives and it is thought that their varied diet keeps them healthy. Popular dishes include: seafood platters (with squid and lobsters), lamb with potatoes and fresh salads with: lettuce, cherry tomatoes and feta cheese mixed together. Olive trees have been cultivated in Greece for over 6,000 years and every village has its own olive groves. Greeks add or drizzle olive oil onto most main meals so consume nearly 30 litres of olive oil per person each year. Children start primary school at the age of six and remain there for six years until they go to a gymnasium (high) school at the age of 12. They are taught subjects such as: maths, PE, modern Greek, theatrical studies and English as a foreign language. A 'presidium' (group of four children) is elected in the older classes to help prepare and decorate the rooms for the national holidays. A normal school day starts at quarter-past eight in the morning and finishes at about 1 o'clock in the early afternoon before it gets too hot. The summer holiday lasts for three months. Sport is very popular in Greece because it is the birthplace of the Olympic Games, first recorded in 776BC. The Panathenaic Stadium in Athens, a replica of an ancient Greek stadium, has hosted several modern Olympic events in recent years, including part of the 2004 Summer games. The marathon is a long-distance running event over 26 and a quarter miles which normally takes place on roads. It commemorates the run made by a Greek soldier called Pheidippides, to send a message from the Battle of Marathon, to Athens in about 490BC. The Greek Super League is highest football league in the country and it contains 16 teams. Festivals are also very popular in Greece. Aprokries, for example, is a Christian festival that begins four Sundays before Lent and ends on 'Clean Monday' which is the first day of Lent. The last Sunday of the celebration is when houses are cleared of all meat and dairy products in them. 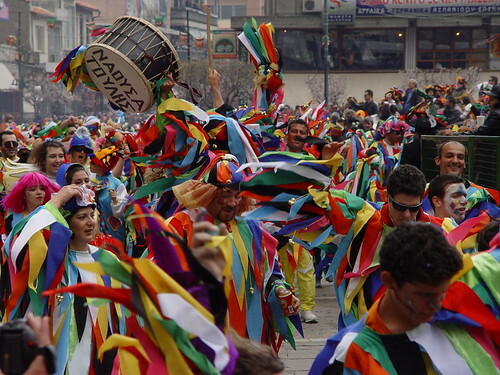 Magnificent carnival parades take place all around Greece which finish with a bonfire. Many people wear costumes depicting death to show the ending of winter and the start of spring.